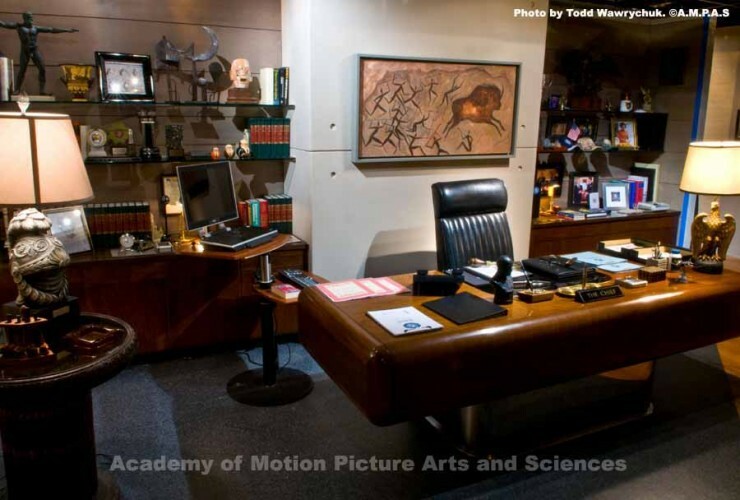 Set decoration highlighted at the Academy of Motion Picture Arts & Sciences! 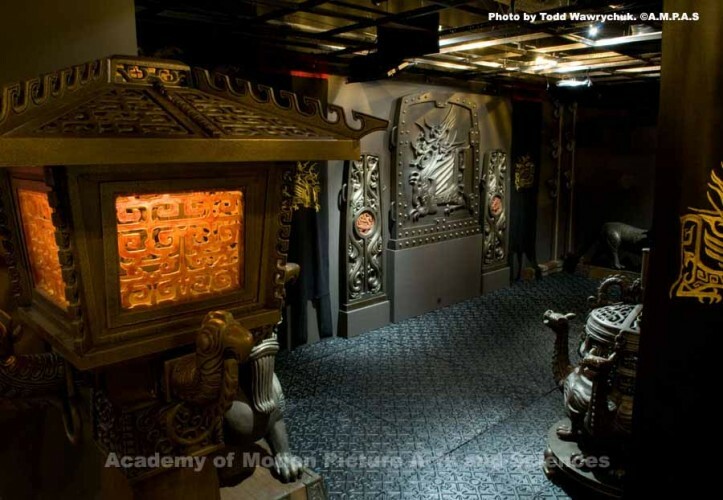 The Academy of Motion Picture Arts & Sciences focuses on set decoration in the new exhibition, Pulling Back the Drapes: Set Decoration Revealed, which runs from May 16 through August 24, 2008, in the Academy’s 4th floor Gallery. 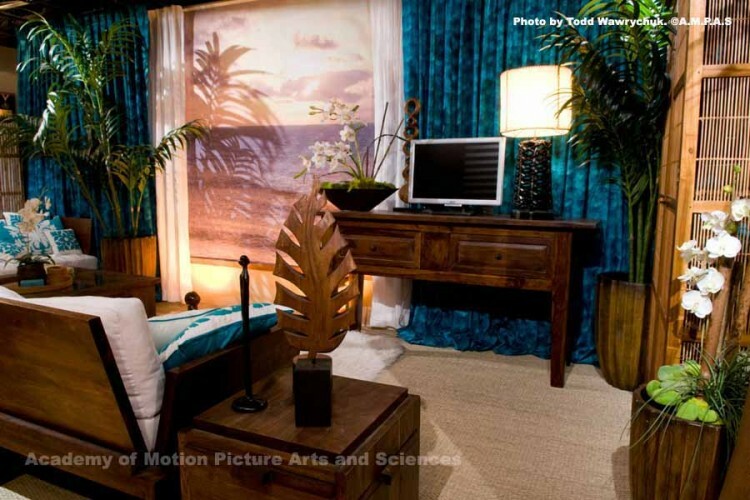 Visitors walk through vignettes and portions of sets re-created from seven current films typical of a range of challenges engaged by set decorators. 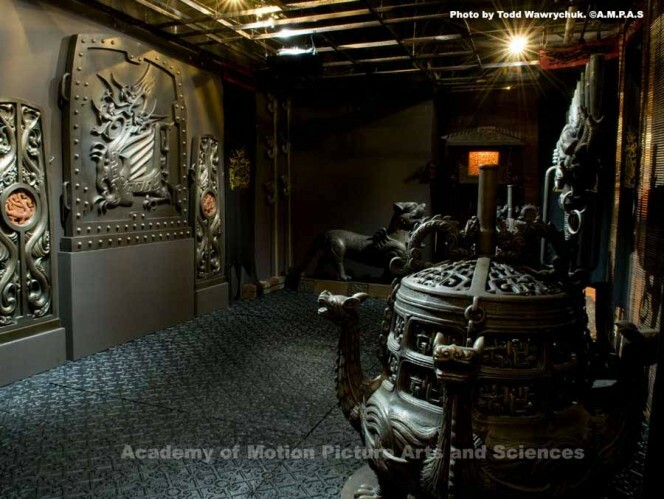 Guests at the free exhibition, which is open to the public, can view behind-the-scenes footage, watch interviews with the set decorators and take a look at some of the tools of the profession. 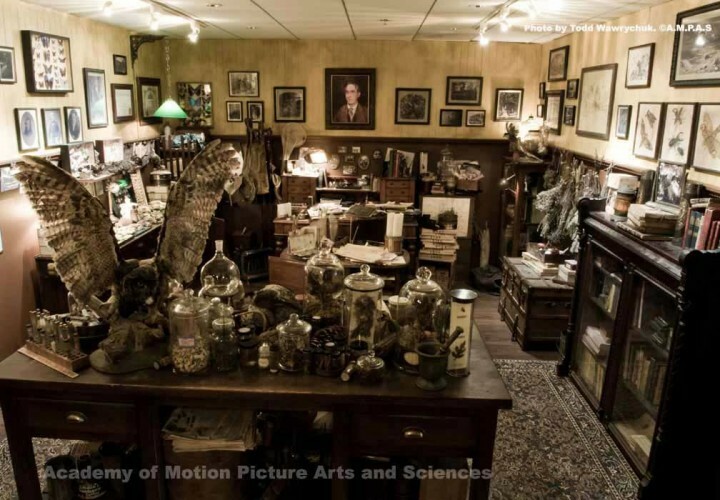 As part of the production design team, the set decorator is primarily responsible for giving a level of physical reality to the environments chosen by a film’s director and production designer. Whether it’s a character’s bedroom, office or secret hideaway, the space has to convey something about that character’s personality, past experience or present emotional state in just a few seconds of screen time. 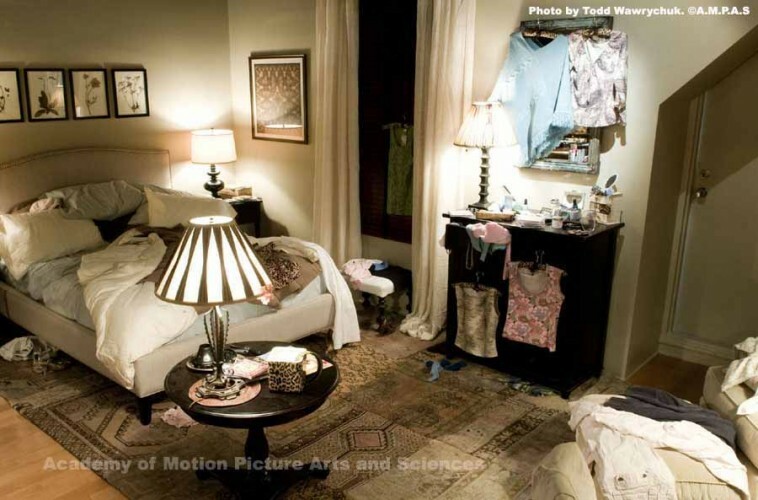 The set decorator makes those decisions, large and small, about furniture, fabrics, color, personal items and the plethora of objects that give the audience a window into the character’s mind or heart. K.C. 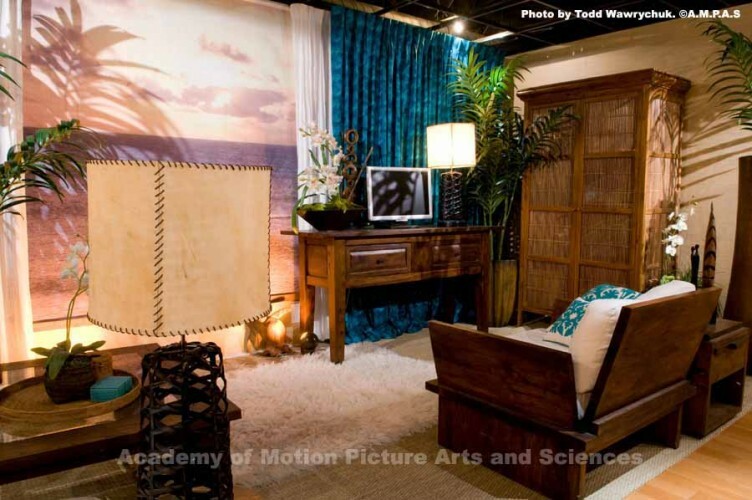 Fox, FORGETTING SARAH MARSHALL – Among the many settings in this contemporary romantic comedy is an elaborate Hawaiian hotel suite, part of which is re-created in the Academy Gallery. 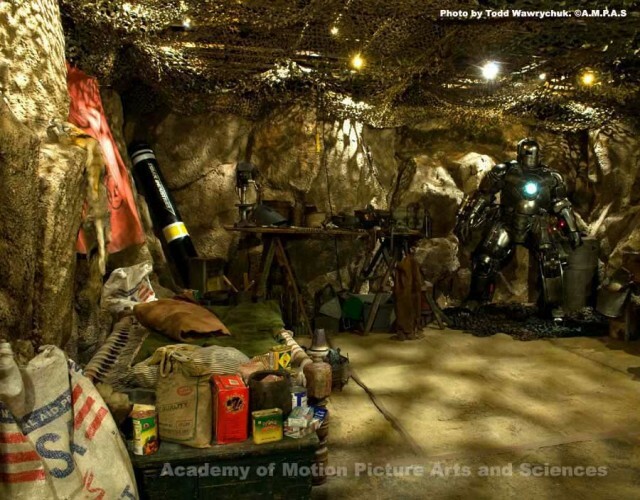 Lauri Gaffin, IRON MAN – The Marvel comic book character comes to life in some stunning environments, including a re-created cave set. Anne Kuljian, THE MUMMY: TOMB OF THE DRAGON EMPEROR – This installation features oversized pieces inspired by local Chinese art techniques and artifacts - all to “great” effect. Jan Pascale, THE SPIDERWICK CHRONICLES – Based on a successful series of novels for young readers, this production required unusual, and some might say haunted, environments, including a mysterious attic, re-created in the gallery’s alcove. 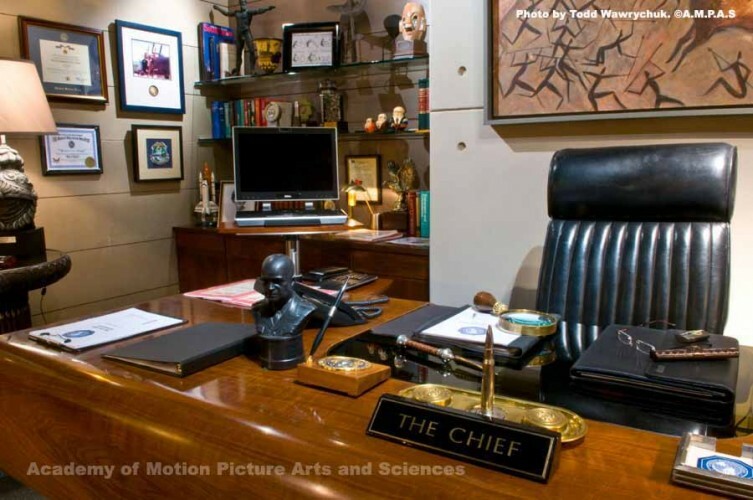 Leslie Rollins, GET SMART – A reproduction of the Chief’s office contains references to the original television series from a generation ago. Susan Bode Tyson, BABY MAMA – The main character’s bedroom is a focal point in this modern-day domestic comedy, in which a successful but childless executive hires a woman to give birth for her. Larry Dias, INDIANA JONES AND THE KINGDOM OF THE CRYSTAL SKULL – For Indiana Jones to agree to one last caper, the adventure had to be fantastic. 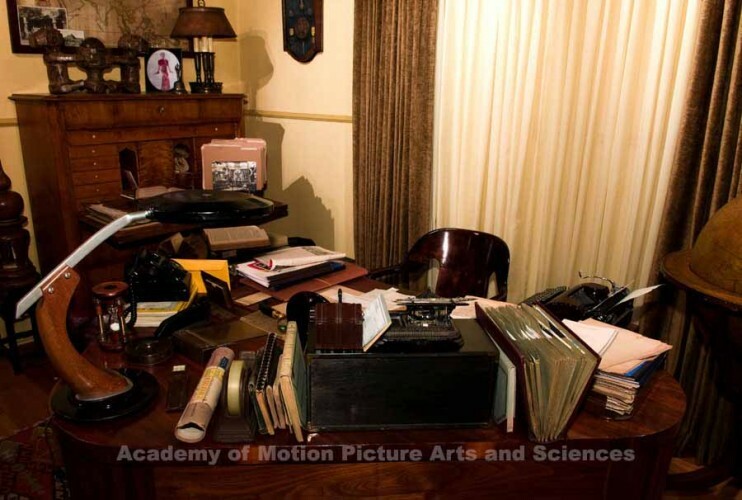 His home library and desk on view say a lot about Indy’s past and his interests. The ability to meet challenges and problem-solving are inherent in the position of set decorator. Creativity is required for more than visual impact and credibility. The exhibitors pulled back the drapes and shared some of the innumerable challenges they met for these sets…. Click to view KTLA Interviews with the decorators. Lauri Gaffin had two opposite worlds to deal with for the super hero action film IRON MAN. 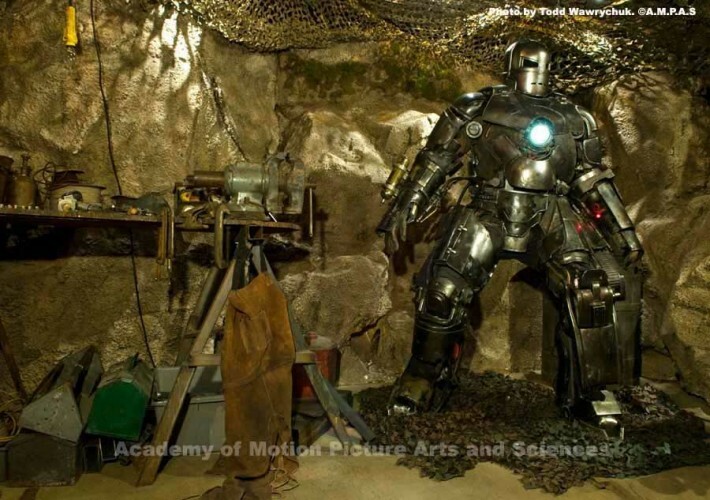 The sets for Tony Stark’s contemporary lavish lifestyle and cutting-edge technology contrast heavily with the remote, primitive cave in which he is imprisoned. Gaffin used a mix of elements to produce a realistic cache and cell for the cavern set, which was built on stage, and part of which has been re-created for the exhibition. Gaffin notes, “Our job is to fully facilitate the story and create direct references for the actor. For this film, a big challenge was how to demonstrate Stark’s character. The cave is a crucial set because it tells the story of Tony Stark's moral fiber that sets the tone for the rest of the movie. At first Tony is a prisoner here, helpless and dying. Then his relentless creativity and ‘can-do’ spirit urge him forward to turn the weapons cache and filthy junk around him into the first Iron Man suit, which will save his life and allow him to ultimately save humanity. Our objects had to facilitate this pivotal story point and make it entirely believable." Much research is involved to create any set. This one included missiles, welders and braziers. Some items were found at flea markets, junkyards and prophouses, but Gaffin also had many pieces fabricated, including practical lighting. She and her team worked with Director of Photography Matthew Libatique to determine what would be appropriate, ranging from stark lamps run on generators, to the glow from a forge, and the muted light of lanterns and candles. She had everything fabricated in China and ended up freighting containers of set dressing to Montreal, Canada, for sets shot on stage there. The Emperor’s Throne Room was a massive set with oversized, but highly detailed components. Kuljian brings replicas of some of the pieces, including part of the throne, to the exhibition. Indeed, details give credulity to the arcane naturalist’s realm of THE SPIDERWICK CHRONICLES, and exhibition-goers will be mesmerized by the intricacies of the set. 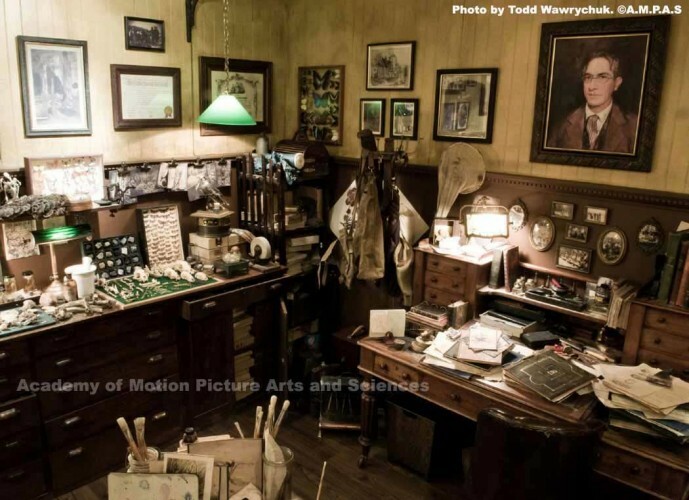 Pascale had a team of Canadian set decorators, headed by Paul Hotte, working for months on the Spiderwick House. Philippe Lord was assigned to focus on shopping for the Secret Study. He found a nature photographer with large format period negatives and photographic equipment, which quickly became Arthur’s. A bonus to the exhibition is a re-creation of Thimbletack’s Nest, which was hidden in the house’s dumbwaiter. The living space for Thimbletack, the house brownie and protector of Arthur’s secrets had its own set of obstacles. “He spirited little things from the family he loved and protected, so each item needed to reflect the different individuals,” describes Pascale. Since the storyline has the children inadvertently trashing the nest, Pascale and team had to come up with identical pieces for this tiny set that is seen only for a few moments. Opposites come up again in the film BABY MAMA, but this time it is different personas that have to be visually conveyed. Susan Bode Tyson’s depiction of the dueling traits between the classic, seemingly in-control career woman desperately wanting to be a mother and the child-like uninhibited surrogate carrying her baby is clearly defined in the set Kate’s Bedroom. Tyson describes, “Kate is a very buttoned-up, organized person. The set was originally mildly interesting, but when the Angie character moves in with her, you get a sense of their very different worlds. And their worlds somewhat collide.” The set takes on layers of both things and personalities. There is evidence that Angie tosses and dumps everything anywhere and everywhere. The bedroom as a microcosm of our lives is clearly depicted in this set. The name Indiana Jones conjures up wild adventures at the far corners of the earth, but by 1957, the time period for INDIANA JONES AND THE KINGDOM OF THE CRYSTAL SKULL, the maverick archaeologist spends more time as a professor at Marshall College. His home has been updated by Set Decorator Larry Dias and Production Designer Guy Dyas, building upon the Art Deco bones of the earlier incarnation. 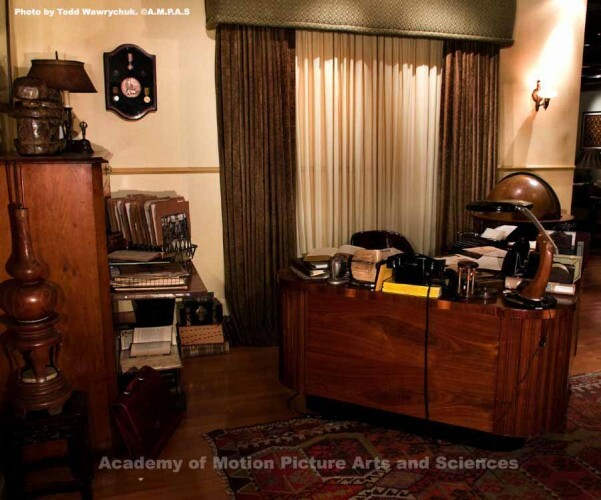 His home library/study, tucked into the corner of the living room, is on display as part of the AMPAS exhibition.